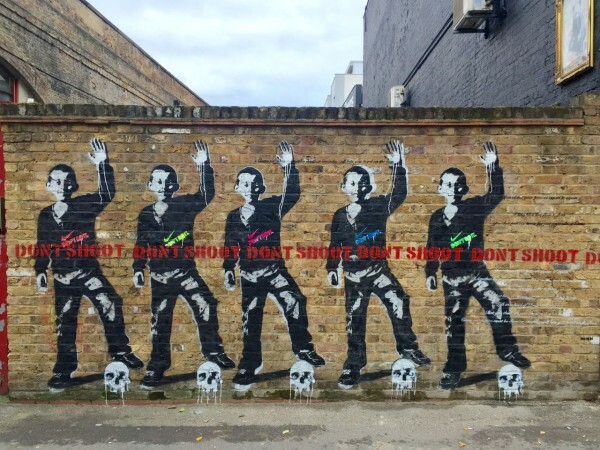 Don't Shoot, by Bambi in Shoreditch, East London. Photo courtesy of Dream Deferred. At a press conference on August 10, 2016, Los Angeles Police Department Deputy Chief Robert Arcos presented its account of the fatal officer-involved shooting of Jesse Reomero, a 14-year-old Mexican-American boy that Hollenbeck Gang Enforcement Detail officers were chasing for allegedly writing gang graffiti. In a Los Angeles Times video of yesterday's press conference, Arcos said the incident began when the police received a radio report of vandalism suspects near Chicago Street and Cesar Chavez Avenue in the Boyle Heights neighborhood of Los Angeles. After police arrived Romero ran. As officers approached the corner of Breed Street and Cesar Chavez, they allegedly heard a gun shot. When they turned the corner, one of the officers fatally shot Romero. Police presented a picture of an antiquated handgun at the conference. Arcos said that a witness had seen Romero point a gun at police and pull the trigger. But another witness told the L.A. Times that she saw Romero throw the gun toward a fence as he ran and the gun went off. Click here to read the full Colorlines article for the witness' account.